I don't get the appeal of eating baked goods on sticks, but toddlers do. 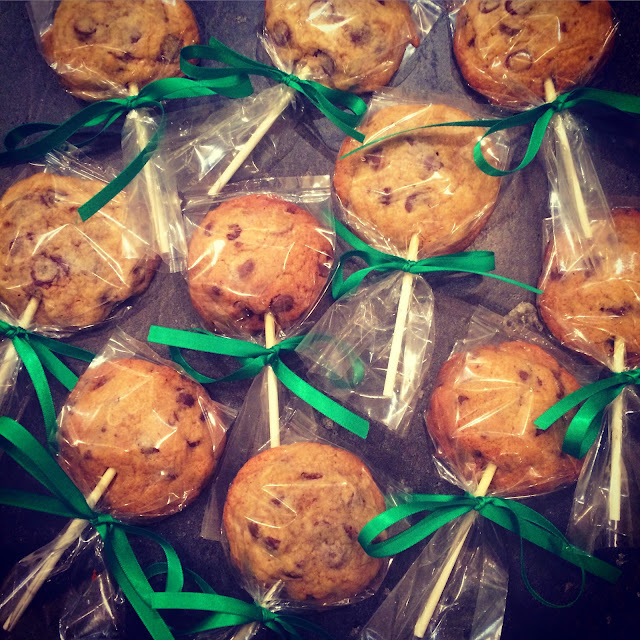 My 3 year old suggested cookie pops as a birthday treat for his friend, so we tried it with a delicious soft and chewy chocolate chip cookie recipe and it worked. Maybe there's an easier way to do the sticks part, but I just made up my own approach. I wrapped all but the tips of the lollipop sticks, which I already had, in aluminum foil and stuck them about an inch into the ball of dough parallel to the cookie tray surface. After the cookies come out of the oven, wait until the cookies are cool before you move them. The sticks will come out of the cookies if they haven't set. And you'll have to eat those ones right away. After the cookies were totally cool, I wrapped them in individual cellophane bags and tied them with ribbon. I'm perfectly happy eating a cookie that's not on a stick, but the stick and packaging definitely adds dimension to the presentation.